Normal growth and nutritional needs vary greatly between a 2 pound Yorkie pup, and a 35 pound Great Dane pup! We will watch for growth problems unique to each size of dog, and make feeding recommendations to help keep them from happening. Our vaccine protocol centers on the distemper combination vaccine, and rabies vaccination. The distemper vaccine protects your puppy against 5 – 7 different serious diseases, including the parvo virus diarrhea we mentioned in our introduction. Rabies is a deadly viral nervous system infection that people can catch. Simple, easy, inexpensive vaccination protects against what could otherwise be a disaster! Deworming starts at your puppy’s first visit with us. The most common intestinal worms (roundworms, hookworms, and whipworms) can survive for up to 10 years in soil. Puppies are almost always born with roundworms. Roundworms and hookworms have baby stages that are infectious to people! 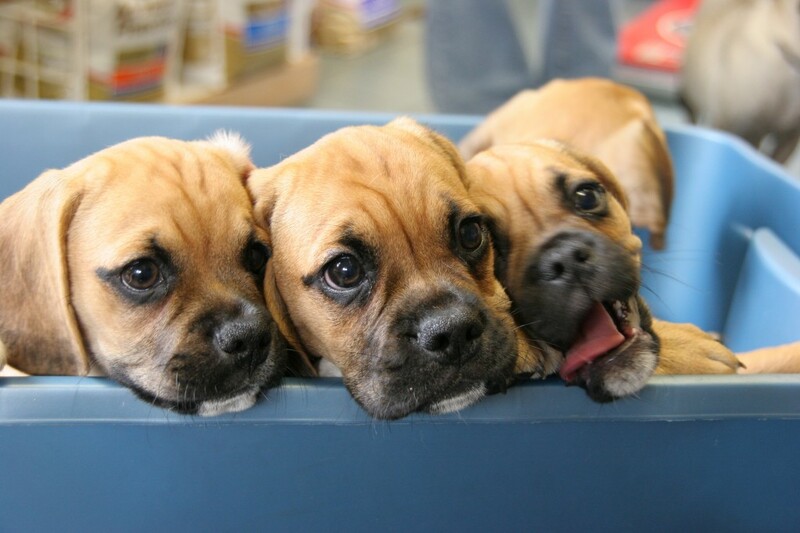 For all these reasons, we recommend monthly deworming for puppies. This deworming can often be done in conjunction with flea prevention if needed. Finally, we will talk about house training, and generally teaching your puppy to be an enjoyable member of your household. We want to help you set the stage for having a good companion for many years to come. Parvovirus diarrhea is a devastating, and can be prevented with proper vaccination. Unfortunately, many puppies are not adequately vaccinated, and come down with the disease. Even with aggressive treatment, many of these pups do not make it. To increase our chances of success here at the State Street Animal Hospital, PC, we include a blood transfusion from a well vaccinated dog early in our course of treatment. This provides an often anemic puppy with healthy red blood cells, but even more importantly provides antibodies to fight the virus. These photos show two of our success stories, with their blood donors. Mia, a Borzoi owned by our veterinary technician Renee, donated blood to Alfonzo — supposedly a beagle cross who ended up growing MUCH larger than a Beagle! Fancy, a Bernese Mountain Dog owned by our assistant Karen,donated blood to Molly, a Golden Retriever puppy, who has gone on to live a happy life.